Semana Santa in Seville marks one of the most important events in the year in this part of Andalucia. What began as a religious festival has grown to encompass the whole city, with even the metro systems adjusting accordingly. Taking part in Semana Santa in Seville is an experience that will linger long after the incense and swishing robes have gone. Here’s what Semana Santa in Seville is like. And how, as a visitor, you can join in. On a spring afternoon, with orange blossom filtering the sunshine, I saw my first one. Looming tall and dressed entirely in black, the hood masked his face before rising upwards to a point above his head. His hands were gloved, the dark robe flowing and two, blinking dark eyes watched me. Semana Santa, Holy Week, arrived in Seville this week and this nazareno was on his way to a religious procession involving one of the local brotherhoods. It’s a shame that the outfits, a tradition that dates back to the 14th century in the case of the El Silencio society, now trigger images of the Ku Klux Klan, lynching, fire and fear to those of us more familiar with stories from America than Andalucía. The intimidation faded, however, when the next nazareno I saw, in white and violet, smacked the point of his hood into an overhanging orange branch. After that, I watched unsteady columns of children practice their steps for the big event and even found a crestfallen nazarenito with his mother in the toilets after an accident involving his ceremonial gown. Each brotherhood, or cofradía, has its own combination of colours, embroidered motif and pre-planned procession route entered into a municipal database. This year you can download the programme straight to your mobile phone, complete with the football fixtures and calendar for the bullfighting season. Semana Santa may lack the controversy of the blood of the bullring, but not everyone in Seville is a fan. Some object on secular grounds, some associate the festival with certain political views, others just wish for more peace and quiet. On Jueves Santo, Maundy Thursday, the nazarenos stride on until dawn and beyond and it’s this Madrugada that dazzles the most. Rows upon rows of folded wooden chairs stretch back from the cathedral into the cobbled side streets, with entrance points guarded by security and the police. On the outskirts, Puerta Jerez is alight with candy floss stalls and ice cream and the processions distribute sweets wrapped in shiny gold paper and the image of a crying virgin. Closer to La Giralda, however, the mood becomes sombre. Elegant women wearing black lace veils and killer heels hold the hands of children with parted hair and velvet breeches. As darkness falls, stooped pilgrims file past, silent and barefoot, carrying huge wooden crosses. It’s in these moments of quiet that the mechanics of the pasos, the floats, become clear. 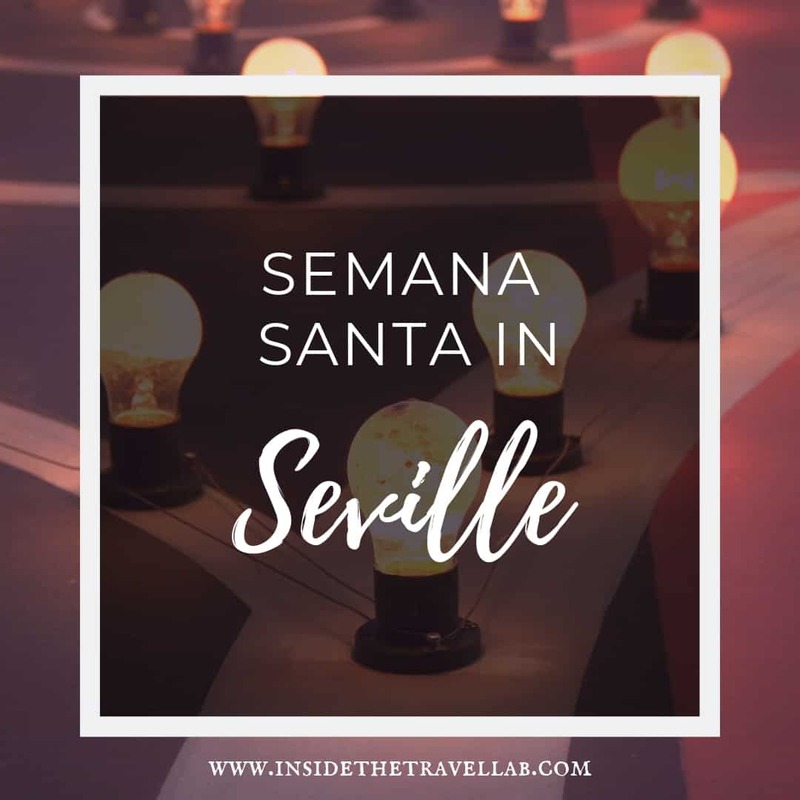 Generations have cherished these life-size figures of Christ and the Virgin Mary and this week, decked in silver and gold, they creak and shudder through Seville on the shoulders of invisible men. A suited director coordinates the team, issuing instructions through the camouflaged grating on the base of the float. Unlike the others, these men wear casual clothes and a headdress that resembles a cross between a turban and a croissant-shaped cushion. As with everything, Seville’s Semana Santa has its own star turns and they include El Silencio and Gran Poder, with crowds of people running through the streets in order to catch the procession at the next viewing point. Then there’s the Macarena that begins at midnight and continues until the following afternoon. By three in the morning, however, I am exhausted. Luckily the metro is open all night to take me home. If you haven’t guessed it yet, Seville takes Semana Santa quite seriously. If you haven’t guessed it yet, Seville takes Semana Santa quite seriously.